The first emperor of Kai dynasty was Kai-Kabad. He ruled in Persia and his Capital was Persipolis. He ruled for 15 years. He was followed by his son Kai-Kaus. Son of Kai-Kaus was married to princess of Turan (Central Asia), a daughter of king Afrasyab. The result of this marital union was the birth of a great king Kai-Khusro who later ruled over Persia. According to interprettations of Historians, Kai-Khusro was the successor of Darius I. The names for these Achamenian kings as appear in Greek are very much corrupted form of actual names of Persian and Hindu traditions. As is stated above the kings of Kai dynasty of the Persian traditions correspond to those from the Achamenian dynasty of the Greek writings and that of O.P Inscriptions. Further, numerous scholars have related the Achaemenian kings to the Persian Kambojas. Muslim Kambohs have a tradition they descended from the ancient Kai dynasty of Persia. Muhammad Umar writes: “The (Muslim) Kamboh distinguished themselves by their courage, generosity and high spirits. They were famous for their excellent manners and were particularly gifted with wisdom and nobility…..perhaps with a view to maintaining the purity of their descent, or because of pride of nobility, they confined their matrimonial relationships within their own groups and did not establish marriage connections with other Muslim groups including even the Saiyids and the Mughals.” Kambojs are known as adventurous and enterprising people. Ministry Obstacles Spiritual opposition to the Gospel is intense in Pakistan. Outreach Ideas Pray for an insatiable hunger in the hearts of the Kamboh for knowledge of the true God. 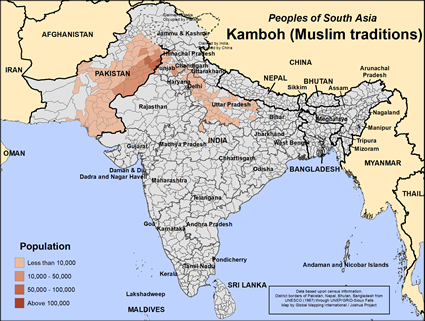 Pray for the Followers of Christ There may not be a single follower of Jesus among the Kamboh today, in either Pakistan or India. Please pray the Lord will begin to stir their hearts to seek a Savior for their sin. Pray for the Entire People Group Please pray the Kamboh community will be set free from a religion that offers no promise of eternal life, nor does it offer power for living this life victoriously.